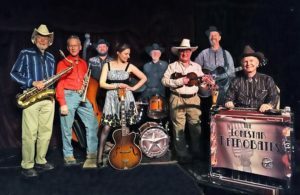 The Lonestar Retrobates are a boot-scootin’ wingtips-flyin’ dance band specializing in authentic West Coast Swing and influenced by West Coast Cowjazz, Rockabilly, Swing, Jazz, Bluegrass, Blues, Barnyard Boogie Woogie, Roadhouse Swing, Western Swing, and Gypsy Jazz. Featuring trumpet, sax, twin fiddles, both standard and pedal steel guitars, drums and standup bass, rich 4- and 5-part vocal harmonies and even trick yodeling on demand, the Retrobates sashay from hot swing to honkytonk. In a word, FUN! The Woodchopper’s Ball, named after the classic 1939 swing tune by the Woody Herman Orchestra, is a weekly Tuesday swing dance event held at the historic Verdi Club in San Francisco. * LIVE MUSIC DANCE PARTY, 9:00-11:30pm, with a different band each week! $10 admission, all ages. Includes a drop-in Basic Swing dance lesson (9:00-9:15pm), perfect for complete beginners (no partner required)! * FULL BAR & LOUNGE, 7:30pm-closing (21+ only)! Enjoy a classic cocktail in the swanky, newly renovated lounge! * 2,500-SQ-FT DANCE FLOOR: Large, beautiful, hardwood dance floor with plenty of room to swing out! * JANUARY Beginning and Intermediate LINDY HOP & BALBOA monthly swing dance class series continue tonight, 7:00-9:00pm. Single Monthly Class drop-in: $20/person/week, all ages. Enrollment includes admission to Dance Parties!